Racing back to Qatar for Rd. 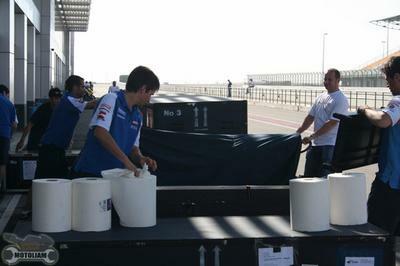 2 of the Losail National Cup - and MotoGP comes to Test! 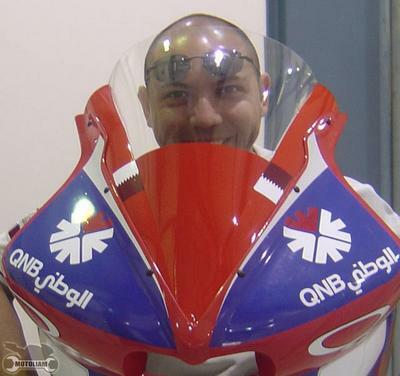 I'm heading back to Qatar for round #2 of the Qatar National Championship and hoping to make a good showing. Like the last time, I'm not sure what my internet contact level will be. 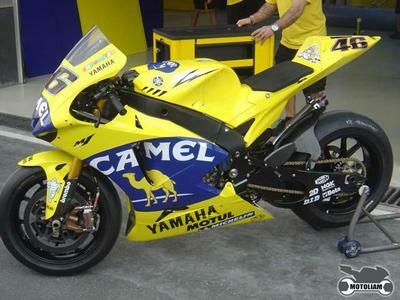 . . but word is that Suzuki and Camel Yamaha will be in attendance for some preseason testing - Boooooo-Yaaaahhhhh! Hopefully I can get some good photos if I can break away from work, but work will be the #1 priority so we'll just have to see. I'm just stoked that d'Antin's crew asked me back for another shot! Trivia time! Which spot is this and why is it significant?!? Ok! I'm back in BCN after a busy weekend filled with all manner of flight delays, missed connections, and lost luggage. Since I don't have any of my equipment (still lost! 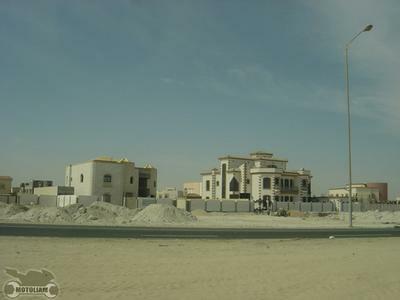 ), might as well update Barf with some pics of my latest trip to Qatar. 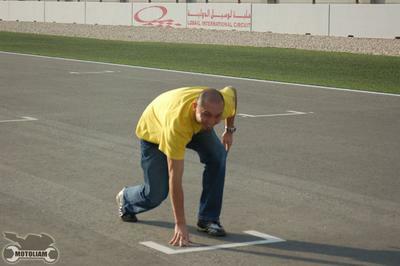 I'd also like to welcome Trikedog and confirm that Ecruz got the trivia question correct, it is the spot Rossi was forced to start from (the back of the grid) after Sete's crew called foul during the Qatar GP of '04. I met up with the BCN crew and we took off for Heathrow. London without a hitch. Unlike the last time where I was separated from the guys because of my US passport, this time we took a different maze through the airport and managed to stick together. This photo shows how strong Dunlop is in England! I was surpirsed to see this, because it was very subtle, but I caught it nonetheless. 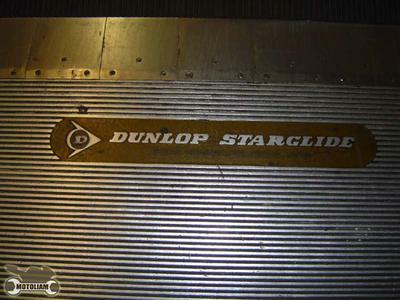 Not only do they make tires, but the rubber belts on the people conveyors in the airport are Dunnies, too! I wish tires had names like this! Sportmax just doesn't have the same ring to it. 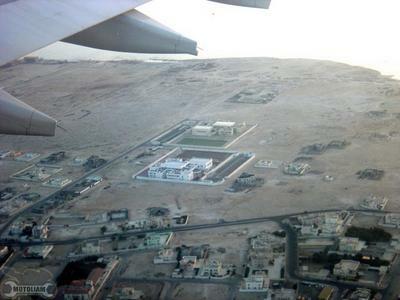 Here's an aerial shot as we were approaching Doha. Most of the city looks like this, spaced out, relatively flat, and no green. I think the green square is actually Astro-turf, more on that later. Great Googily Moogily! They let me have a car! I'm not sure why, but the co-ordinator decided that I would be responsible for getting some of the guys to and from the track. This was the first time I've driven a car since I left the states in late October, so I was pumped. I should also mention that this was my first time dealing with Roundabouts (and at high speed) so I had a lot of fun. There are speed limits posted, but in my experience, the drivers basically drive as if there are no rules. It's all true. I have never been to a place where I was allowed to drive to the maximum of the car's potential, literally flooring it every time and only backing off to slow a bit for the turns. My co-pilot insisted on using the e-brake all the time and I thought we were going to rip the rubber off the wheels. It was awesome! If you want a Rally type driving experience, get over here. The area is all desert, and the longer roads are all two lanes wide, topped out, a few feet from the sandy desert. . . . you could conceivably slow a bit, and bomb into the sand and start spinning around and bouncing offf of things if you wanted to! Davide, Paco, Carlos, Javier, Rafa, and Ismael. 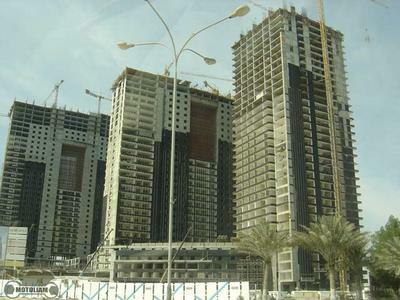 This city is still under construction, and I think most of the buildings are within ten to fifteen years old. Many of the roads were being worked on and expanded and there are construction trucks trundling along slowing us down. Here's a common sight in the city. Here's what most of the buildings in the city (and outside the city) look like. Just like the last time, I arrived at dawn on Thursday and a few hours later was at the track. It was a full day of work prepping the bikes and making sure everything was going to be "just right" for the race on Saturday. I took a moment to check out the track up close. . . and it really is Astro-turf! I can't imagine what it's like for a bike to hit this at high speed. The day ended and we headed back to the hotel for a well deserved night's rest. Naturally, I was the lead driver of four other cars (I had the boss in my car) and we got lost, circling the city for an hour. Thank goodness we eventually found the hotel, because the threat potential of driving in that city is off the scale. After dinner a couple of us made it out for a beer, and by a couple I mean everybody! 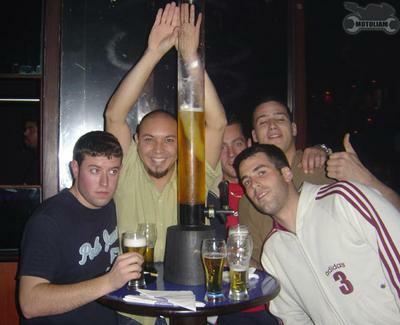 We were able to buy 3 litre beers and the night turned out longer than anyone thought! That's all for day one back in Qatar. The next day was better, as I had more rest and I remembered the way to and from the circuit! I got ahold of my fairings, a day late, and proceeded to get my bike back together since it was still half apart from the wreck three weeks ago. Later in the day, trucks started showing up with boxes. 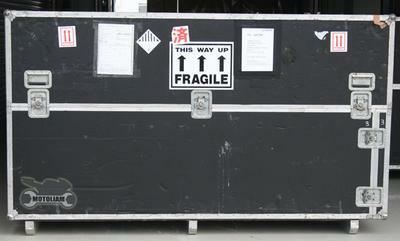 Big boxes . . . . . . .
Everyone gets involved to help set everything up. 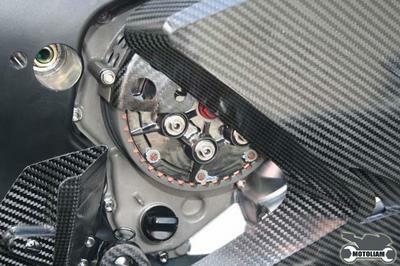 Even Stuart Shelton, chief mechanic for John Hopkins. 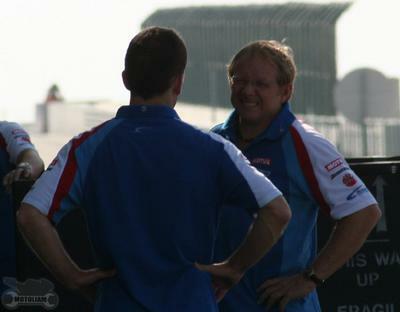 He's been doing this a looong time, and used to work with Kevin Schwantz back in the day. That means one person undoes the latches while everyone else just watches, including me - for now! The top of the box then becomes a table to stack the rolls of paper ,which were stuffed in there to help cushion the bike -- ingenius! There was another track day going on so there were a couple riders who were there. Kind of intimidating to take to a track knowing the biggest boys are there, too. I had to wait a second to get this shot, because I wanted the British flag to be there. Suzuki's GP effort is based in Banbury, England, and first rider, John Hopkins is of British parents, but born American. In person, he's all Southern Californian, though. SoCal! 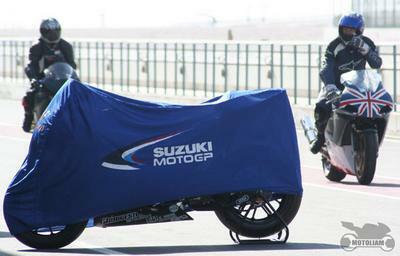 Perhaps Stuart Shelton knows something about the Suzuki that we don't. . . .or maybe he's as crazy about the Qatari food as I am! Whatever it is, they haven't hired me, so phooey, haha. Paul Denning and the pilots weren't scheduled to show up for another day, but I got a chance to scope out some of the technical bits. I had a hell of a time trying to get photos, but since I was there to work, it wasn't very important to me. I will say this. 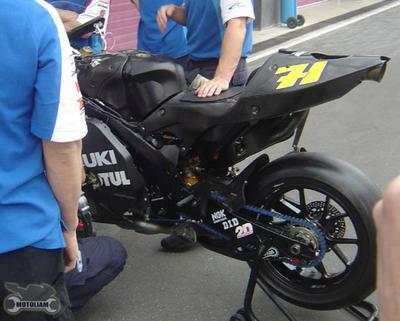 . . . . .Suzuki definitely has a new motor for '06, not just parts inside of it. 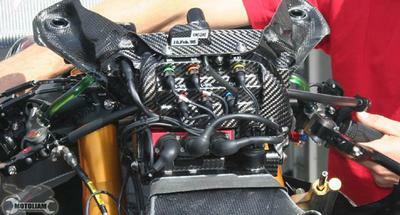 In fact, it's physically larger than last year's and it DOES make more power. 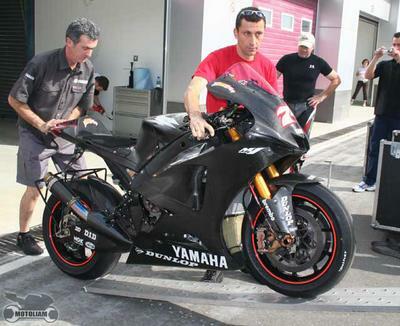 Even so, I'd say the engine is still smaller than the R6 motor. . . .just to give you guys a size reference. 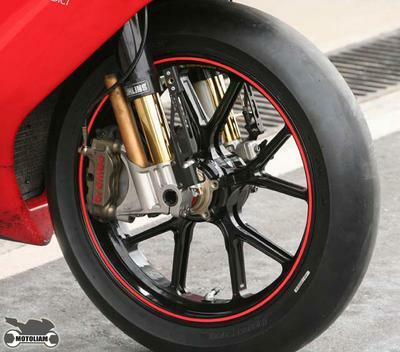 When I first saw these wheels I thought they might be from the Suzuki Alstare team from World Superbike. Turns out the GP team is changing the colors of the rim strips from red to yellow. I think it's the Australian thing. These wheels are made by Joe Bito, a japanese guy who used to a GP mechanic with Honda back in the Eighties. He got out of it a couple years ago and when he tried to get back in there wasn't a place for him. He had always hated the Marchesini's because they broke so easily, and had even gone to their factory to see what was up. Since he knew they were a liability he decided to make his own wheels, and thus, JB Power wheels was born. Talk about finding a niche! 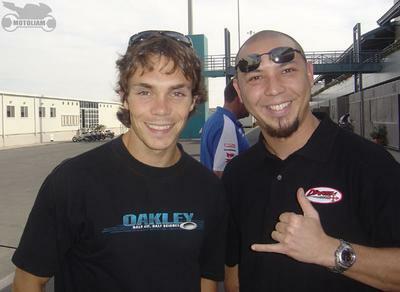 Now Joe is the supplier for several Japanese National teams, SuzukiGP (I think WSBK, too), KawasakiGP, and more. These are the Mag-Tan models, unobtanium indeed. 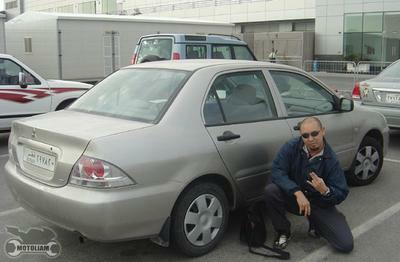 Joe gave me a lift one day when I was hitch-hiking to the circuit in Valencia last year and we had breakfast together. 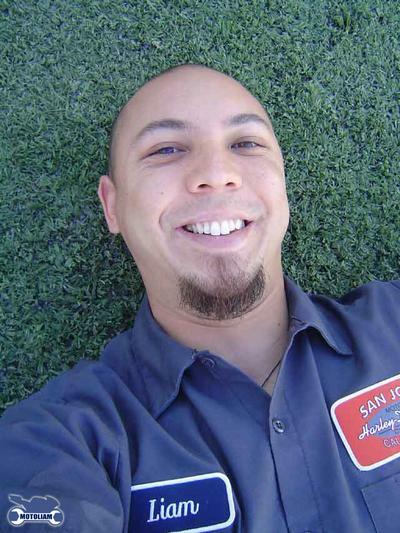 If you ever meet him, drop my name, and be nice, he's a very knowledgable and friendly person. Here I am chumming it up with young Chris Vermeulen. I can never remember how to spell his name, but he seems like a nice guy. It's hard to picture, but the Suzuki team is mostly middle aged men from England, and their riders are a bunch of surf-rats from opposite ends of the Earth. Chris is confident that the Suzuki will be competitive this year, and based on today's testing results (Hopper within a half second of Rossi) it's looking good! I took the time to shoot a shot of my rider, Ali D, screaming down the straightaway. It was tough because my auto focus doesn't work this fast so I ended up just doing it manually. He told me he had been practicing on his R1 the last couple weeks and made some adjustments to his body position based on my advice from the last race. He dropped over ten seconds per lap! My advice? Choke up on the tank in the corners, haha. So naturally, I was busy working in my garage, checking, double checking, triple checking, you know how it goes. It's an interesting perspective to have, that of the race mechanic. One on side, there's this feeling of happiness that comes from being around pure machines, and away from the crowds and the noise. Moreso, there's this feeling of responsibility that comes from the rider's results. If he can't do his best, it's my fault. I have a measure of control over the situation and the results. I'm involved. I'm responsible. It's really hard, not sleeping, travelling, performing precision work, and always trying to better the mechanics around you. It's worth it. But only if I can make it to a point where I work on things like *This*. Who wants to know what this is? Here's my friend, lil' Nacho, Nachete, or Nachito. We met earlier this year through another friend named Roger (who used to work for Dorna). 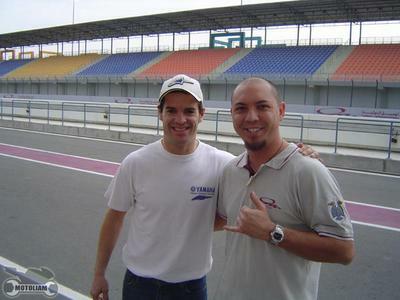 It's thanks to him that I ended up in Qatar in the first place, so thanks Nachito. 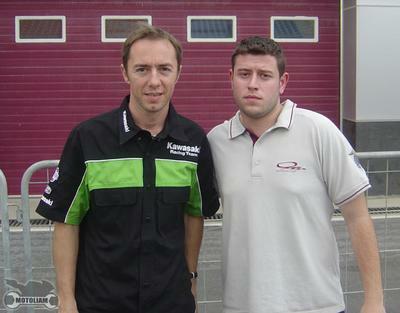 I had met Olivier Jacque before, in Shanghai, so we talked for a little bit about the Kawi and about his chances for some Wildcard rides before Nachito came up and wanted a photo. It felt weird to me to take another photo with him because I already had one from last year and it just seemed weird so I didn't. Plus, I've got a signed copy of Faster - autographed by Oliver - and he's on the cover! How cool is that?!? Jacque is excited about the new bike and I feel like Kawasaki made a mistake by not taking him over De Puniet. This guy was running Italian wheels. . . . I also notice that most of the data acquisition equipment runs these spark plug type connectors. I'd say this is a really clean design and set-up. Actually, now that I've studied them a bit more, these are military grade, locking connectors - much stronger than spark plug connectors and far more impervious to damage. 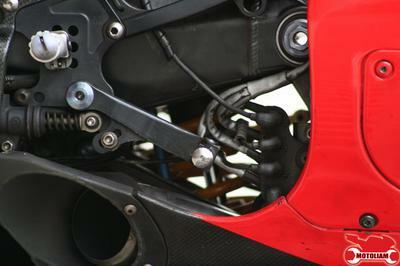 Then you step back, and see how the rear brake line is routed so it's right on the swingarm - which appears to be dented. Maybe it's a way to strengthen that area. 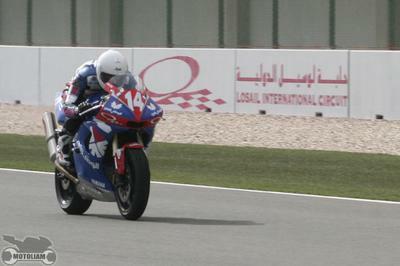 Competitve times for GP bikes at Losail are sub 2 minute laps, and the top Losail Cup riders routinely run 2.17's on their R6's on Michelin Pilot Power Races. My boy was bouncing around in the 2.35-40ish range the first time out but was able to cut it down to qaulifying lap of 2.24 and managed to stay on his bike to end up fourth after five riders wadded. 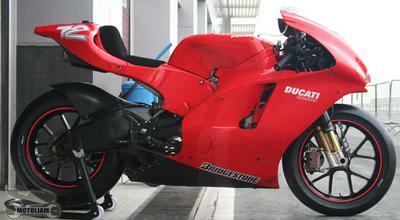 Here's some more of the red bike, which I caught on Friday. I love the profile of this big bike more and more. I used to think it was too organic, but every year this design appeals to me more and I can't wait to see one on the road someday. Is it possible that I'm developing a soft spot for these blunt nosed beasts? 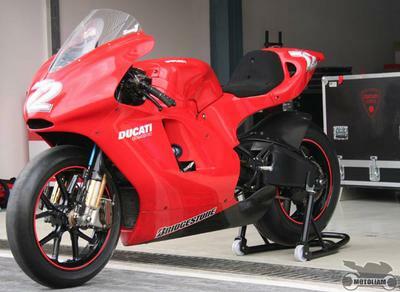 Will we see this design on the 800cc bike next year? 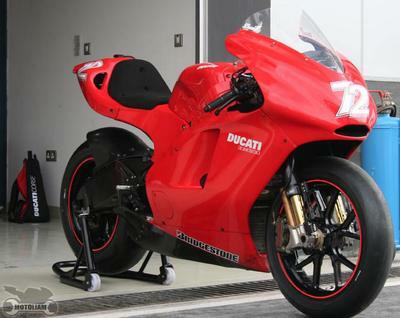 Will this bike ever make it to WSBK? 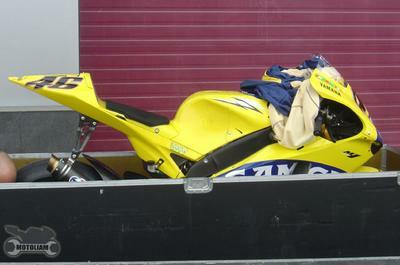 More goodies arrived in boxes - This is the Dunlop shod Yamaha M1 of James Ellison. This bike looks so good in black, and so good in person, I found it hard to believe it was a mere Satellite bike, and the second tier machine at that. Soooo beautiful. Barf. . . . It's Everywhere You Want To Be! Can you imagine your office desk looking like this? Who wouldn't want to go to work?!? Rolling it out of the box and into the garage. 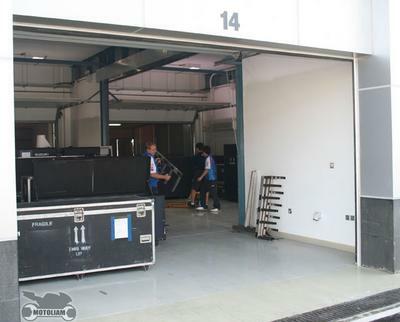 The time for unloading and setting up most of these garages was pretty fast, but because many of the teams arrived at least a day or two before their riders (and the serious work) there was a very relaxed atmosphere in the paddock, and people were walking casually around. I watched as the teams assembled the "walls" that surround the garages, seeing how they clicked and slid together and noticing the shiny paint on the new sponsor schemes. 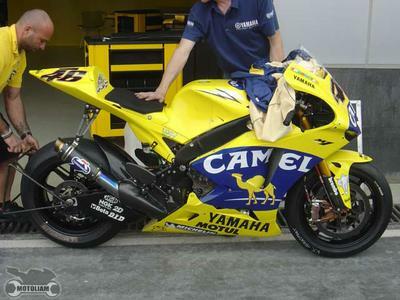 This was Herve Poncharral's team, Tech 3 Yamaha, a french group, and they weren't very friendly. Carlos Checa is riding for them next year and I wonder if his Catalan background (which includes some french influence and french language) will help him better communicate with the team. One thing is for sure, he wouldn't be in the paddock this year if not for Dunlop. Word is that they wanted an experienced rider to evaluate and help develope their tires and they paid for it when no one else would. 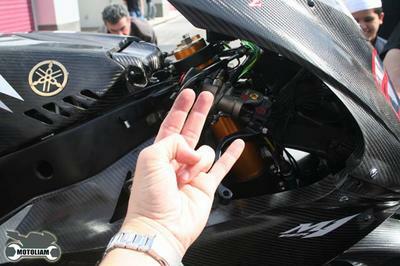 Make no mistake, Tech 3 Yamaha is backed by Dunlop in a big way. Speaking of Carlos Checa, he was looking relieved to be here, strolling around in his t-shirt and jeans. This is a great shot that shows just how desolate this place is. Literally, it's in the desert with nothing around the track for miles. I should also mention that while I was there, a couple WSBK teams were preparing to test, and I ran into a bunch of people at the cafeteria. John Hopkins is happy to know that Californians are watching his season with a lot of excitement, and we had a chance to talk to a bit while waiting in line for the Pasta tray to be refilled. Also present was Noriyuki Haga, but he was busy eating and so was I, so no contact there. Quick note about the 06 GSVR. 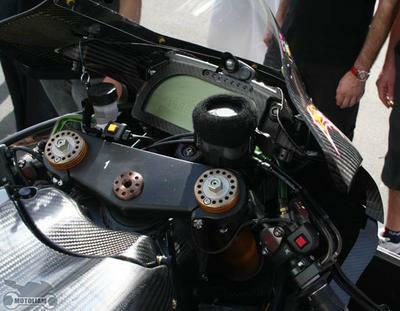 As someone pointed out in another thread, the exhaust plumbing is routed similarly to the Honda's this year, and rumour has it the bike features pneumatic valves. The sound this bike makes on decel is like nothing I have ever heard before. Anyone want to host a 6 second sound bite, up close Also, note the missing "tank" cover. There were a couple guys constantly sanding and trimming these carbon fiber pieces in the lane behind the garages. 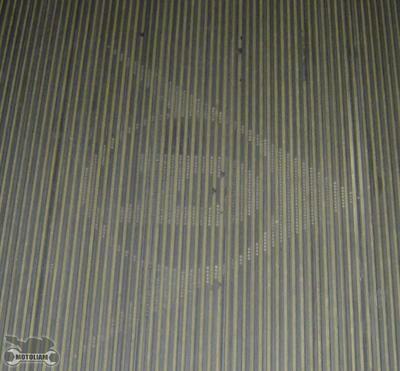 Apparently the whoever laid the fiber got the shape wrong. . . . . shoulda got Tygaboy on it. Better yet, have a listen! I also took a moment to watch this guy for a couple minutes. His name's Wally - and he's Italian. I don't know if you can see all his tattoos, including the ever-present-in-biker-communities spider web tattoo on the elbow! 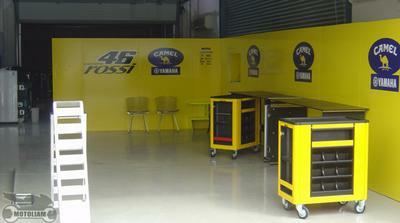 The Camel garage was sparse, though well equipped. Colin's side was identical. I had the chance to say Hi once again to Davide Brivio, Yamaha Race Director and he shared his optimism about the coming season and wasn't fazed at all by all the F1 hype. hmmmm, what have we here? The champ's steed? The bike that would be King. I'm sure we'll be seeing a lot of this machine this year. I noticed that the front number plate is smaller than last years, but that's the only obvious changes I've been able to detect. Might as well see it from the other side. 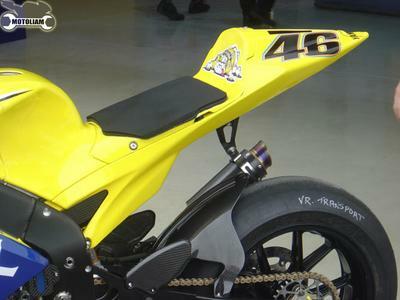 I wonder if Rossi really cares what the graphics look like, since his competitors will likely only see the tail! This one makes great wallpaper. Email me if you want the high-res version. 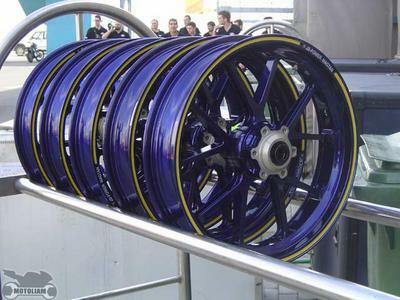 How cool is it to have extra wheels and brakes just to run the "transport tires"? All the bikes have transport tires on them. Surely theft of material can't be the issue. General wear and tear? -- Can you imagine trying to steal the wheels off of this bike? If you get that close, why not steal the whole bike? 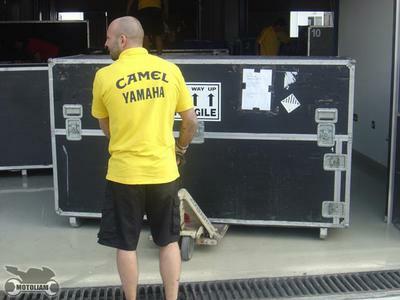 I think Yamaha guards their bikes just fine. Actually, tire theft is a major concern but there's an odd respect throughout the paddock because everyone is there for the same reasons and has the same speed demons driving them. Personally, I think it's so the bike is always looking good, with "fresh" tires on it, instead of shagged ones. Here's the most interesting photo I took all week. . . . . I'll let you rumour mongers get it started before I chime back in. I have some errands to run right now, my luggage is still lost from Sunday's flight, my bike is still trapped in Customs (and it's looking like the taxes alone to get it through will be HIGH) and I need a hat for my bald head. See you guys soon! And let's start planning on some Barf meetings around the world! C'mon people, get out with your bad selves! Oh, and about the photo with Stuart Shelton and John Hopkins checking out the Yamaha. . . . well, it was under wraps until Suzuki came out to fire up some of their bikes. One of the bikes wouldn't catch for quite a while, perhaps evidence of the electrical problems the bikes are suffering from. When the Yamaha guys saw who was right there, they took the sheet off the bike so John could check it out up close -- and he did! 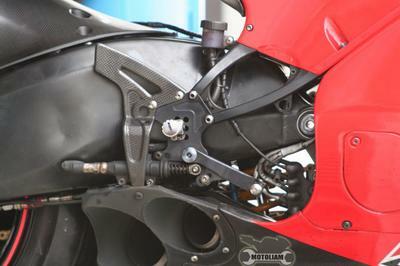 He made a full 360 around the bike and I wonder if this was dangled in front of him at the close of last season. . . . .